After our success with some of the America’s Test Kitchen cookbooks I mentioned, I still have a backlog of recipes from my first round of trying. However, true to form, I couldn’t help but put holds on every one I thought interesting at the library. I tend to go a bit overboard on these kind of things. So, now we have even more to delightfully consume and share. This was a great vegetarian option although you could easily add some chicken or even fish (if you’re into that sort of thing…). I generally am quite pleased with anything pesto-related, and this wasn’t any different. As you can see, we were a little lazy about cutting our asparagus down prior to eating, but it would have cut down on having to do that pesky stop and cut into manageable bites thing had we done it in advance. Our only change for next time was that our package of Udon noodles were thin and came with 3 “bundles” of noodles, and so following the recipe, we only used two. Nevertheless, we both felt there was enough pesto to actually cover all three bundles which would just make for a delicious lunch for Corrie the next day. Bring 4 quarts of water (no salt) to boil in large pot. Process edamame, parsley, cilantro, basil, pine nuts, Parmesan, olive oil, lemon juice and garlic in food processor until smooth, about 20 seconds, scraping down bowl as needed. Transfer to small bowl and season with salt and pepper to taste. Add noodles and asparagus to boiling water and cook, stirring occasionally, until noodles and asparagus are tender, about 4 minutes. Reserve 1 cup cooking water, then drain pasta and asparagus and return them to pot. 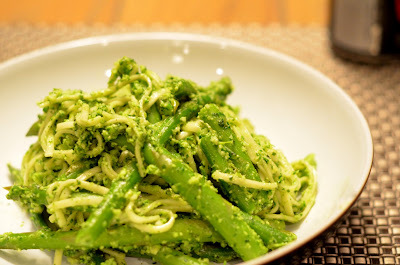 Stir pesto into pot with noodles. Season with salt and pepper to taste and add reserved cooking water as necessary to adjust consistency. Serve. I’ve never had udon noodles before. This looks yummy! I love pesto, too. I highly recommend this one as well, Ashley. 🙂 It’s on our menu again this week!